MELBOURNE RAN : 6 yrs 1950-1956 : re-enlisted 6 yrs 1959-1965. Following information supplied by sister (Elizabeth Moore) of his Daughter-in-law who married Joseph's youngest Son. His full name is Joseph Curtis O/N R/40797 Born 21/9/1921 West Bromich Uk. 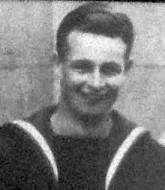 Died 24/9/2003 Dandenong Buried in The Necropolis Springvale He served during the Second World War in RN then came to Australia 1950 He actually saved a young ratings life holding him above water till help arrived then letting him be rescued whilst he waited for the next rescue ship. He was a member of the HMAS Voyager Survivors Assoc. until he passed away. He went with his son to a reunion. Joseph had two son's and three daughters the eldest (Linda) was a WRAN who was killed in a accident in 1967 going from Frankston to Cerberus.